See-Dub: Farewell to a friend. Between classes, I got the news. 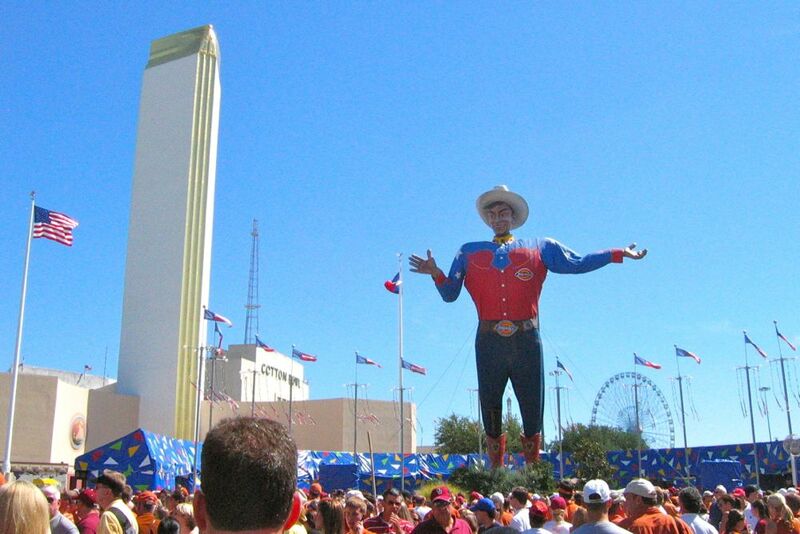 Big Tex is gone. My initial reaction? "Nooooo!" Then I saw the photos, the website slideshow that began with that familiar face, ended with an iron skeleton and had lots of flames in the middle. And I was so very sad. Oh, there are already plenty of good jokes ("The food's not the only thing 'fried' at this year's fair!" 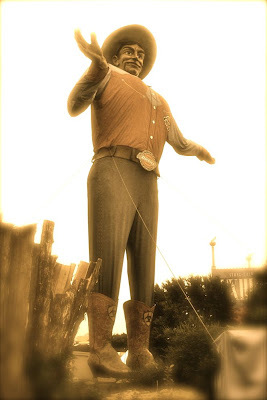 and "Big Tex was packin' heat! "), and yes, it's just a statue, a big ol' prop. But as an icon, Big Tex is so much more, and I'll miss him. The caption: "Nothing like breakfast with an old friend." And he was just that: a familiar face with a friendly (albeit slightly creepy) smile to welcome us back to the hallowed Fair Park. 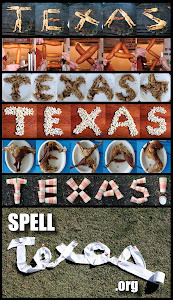 His jaunty wave and well-known "Howdy, folks" greeting signaled autumn as much as pumpkins and changing leaves. Forget Reggie Jackson; Big Tex was the REAL Mr. October. Of course, it didn't take long for me to associate today's loss with my mom. 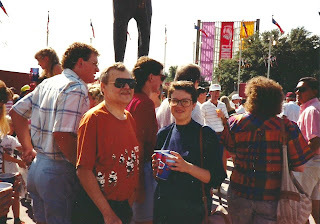 Gone for eight weeks now, my mother LOVED all things Texas, from historical places like San Jacinto and the Alamo to traditional icons like armadillos, cowboys and yes, Big Tex. There are certain traveling rituals that we McCoys always observed, such as spotting the Tower and Capitol as we drove into Austin, looking for the Goodyear blimp in its hangar on our way to Houston, and walking straight to Big Tex when we visited the State Fair. 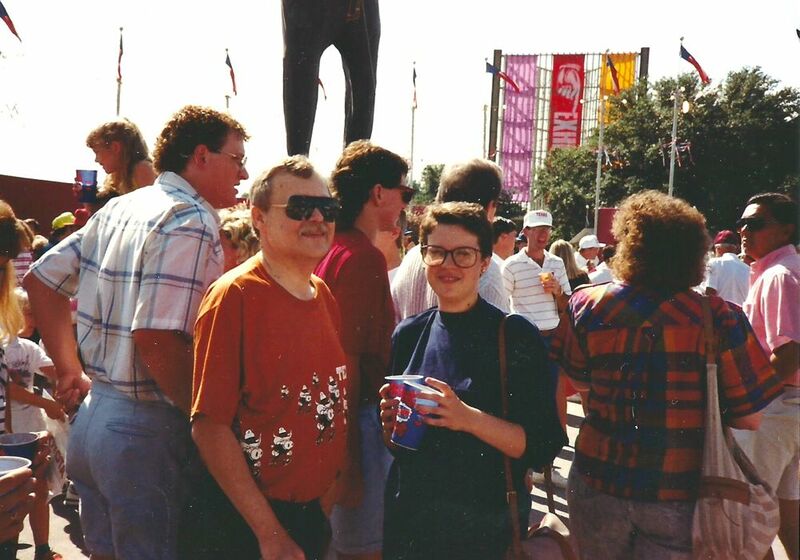 When I was a little girl, Mama and Daddy made sure we used our Columbus Day holiday as a "fair day," making the two-hour drive from Tyler most years to watch the cow-milking demonstrations, grab samples in the Food and Fiber building, peruse the car show, see all the ribbon-winning arts and crafts. Saying howdy to Big Tex was a given. 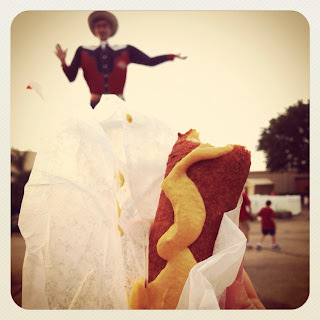 Big Tex's legs showed up in many a photo! Fair officials promise Tex will be back next year, and I know he can be rebuilt, but watching the footage of him burn was strangely painful. To play the shrink here, I can see that my sadness is yet another manifestation of my grief. 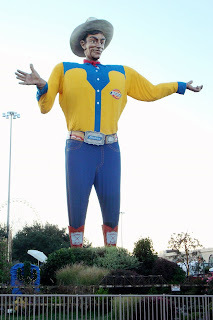 Even though I know Big Tex's demise would've made Mom sad, I still wish I could talk to her about the fire, exchange a few "Did you see that?" moments. 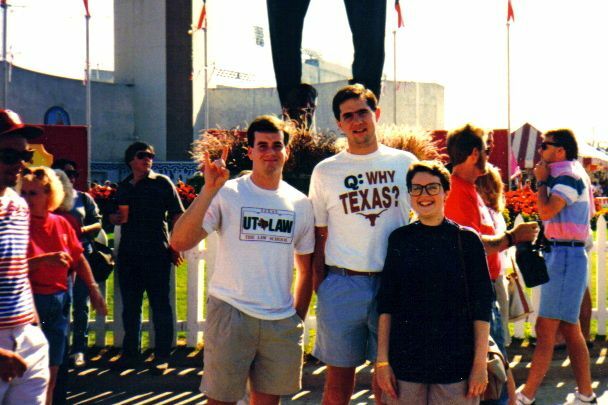 As we bemoaned Tex's loss, she would help me remember the times we shared near that left boot. But most likely, the greater reason for my angst is the reminder that nothing is permanent, not even a giant cowboy who wears a 75-gallon hat.